Lupe Impala, El Chavo Flapjack, and Elirio Malaria love working with cars. You name it, they can fix it. But the team's favorite cars of all are lowriders—cars that hip and hop, dip and drop, go low and slow, bajito y suavecito. The stars align when a contest for the best car around offers a prize of a trunkful of cash—just what the team needs to open their own shop! ¡Ay chihuahua! What will it take to transform a junker into the best car in the universe? Striking, unparalleled art from debut illustrator Raul the Third recalls ballpoint-pen-and-Sharpie desk-drawn doodles, while the story is sketched with Spanish, inked with science facts, and colored with true friendship. With a glossary at the back to provide definitions for Spanish and science terms, this delightful book will educate and entertain in equal measure. 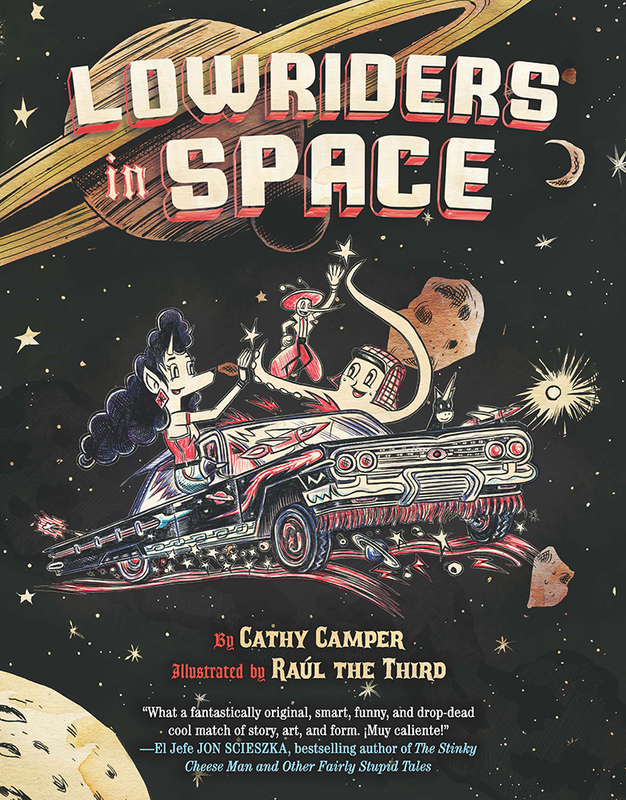 The lovable trio from the acclaimed Lowriders in Space are back! Lupe Impala, Elirio Malaria, and El Chavo Octopus are living their dream at last. They're the proud owners of their very own garage. But when their beloved cat Genie goes missing, they need to do everything they can to find him. Little do they know the trail will lead them to the realm of Mictlantecuhtli, the Aztec god of the Underworld, who is keeping Genie prisoner! With cool Spanish phrases on every page, a glossary of terms, and an action-packed plot that sneaks in science as well as Aztec lore, Lowriders to the Center of the Earth is a linguistic and visual delight. ¡Que suave! When new friends Lupe, Flapjack, and Elirio are each bullied by Las Matamoscas, they know they're going to like one another. When they find out they all love lowrider cars, they know they'll be friends for life. But the bullies won't leave the Lowriders alone—and they don't let any girls or babies into car clubs. Can these three determined outcasts prove they deserve to be in the car show? Humor, Spanish words, and lowrider culture come together in this heartwarming graphic novel of three friends navigating the bumpy terrain of friendship, bullying, and standing up for what you believe in. ¡Vámonos! Little Lobo loves Lucha Libre, and today he and his dog Bernabé have a big job to do, delivering necessary items to people all over the Mercado, even to where the luchadors fight! Friends and neighbors greet them everywhere they go as readers are treated to a full tour of the many sights of the bustling marketplace. Traditional treats like banderas de coco and churros are introduced and enjoyed along with many other cultural items and experiences. Every scene is chock-full of clever details and words to learn in Spanish. Will Little Lobo get to meet El Toro, his favorite luchador ever? ¡Vamos al mercado and let’s find out!